The Boathouse consists of two stylish, modern luxury apartments with a nautical theme, designed and meticulously created over two years by fine craftsmen. It opened in 2003 for discerning travellers. 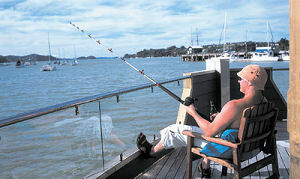 The apartments are located entirely over the water in the heart of the township of Opua adjacent to the car ferry to Russell and, on the other side, the Opua beach. Both apartments offer sweeping views over the Bay of Islands from Veronica Channel to Waitangi, the Black Rocks and beyond. Each apartment has a living area, including balconies, of 142m² (over 1500 sq. ft.) They are fully self-contained including a spacious lounge, fully equipped kitchen and laundry, and outdoor furnishing including gas barbecue. 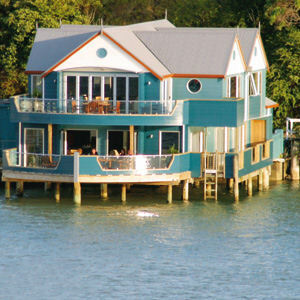 The Boathouse is within minutes walk of the Opua Marina and the Opua-Paihia coastal walkway. The Opua General Store located on the other side of the ferry ramp stocks a full range of groceries, beer and wine and its bakery features fresh bread, croissants and pastries. Accommodates four guests. 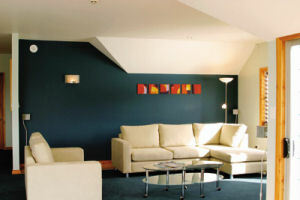 One bedroom with king-size double bed, ensuite dressing and bathroom. One office/bedroom with fold-down double sofa bed. A fold-away bed for a fifth guest, as well as a cot and high chair are available on request. Accommodates four guests. One bedroom with king-size double bed and the second (same size) bedroom with two singles or one king-double, as you choose. A fold-away bed for a fifth guest, as well as a cot and high chair are available on request.